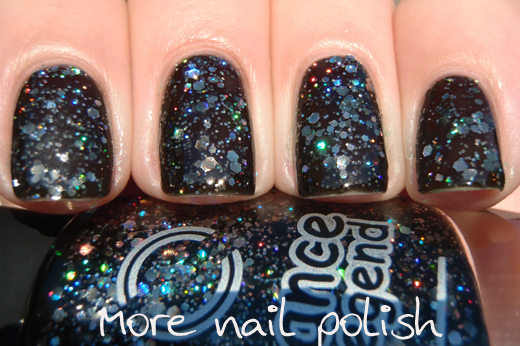 I have a couple more Dance Legend polishes to show you tonight. Just to recap, Dance Legend are a big Russian brand that has recently started shipping worldwide - and from my experience so far, their polishes are amazing. 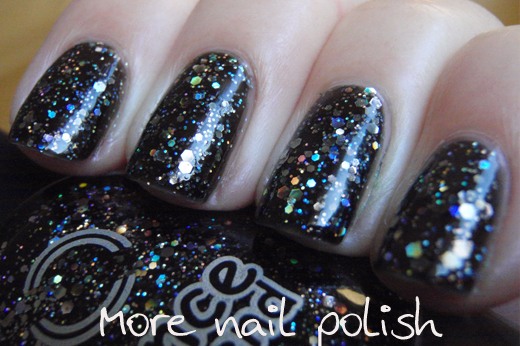 These two polishes are from the Rich Black Collection, which has nine different black finish polishes. 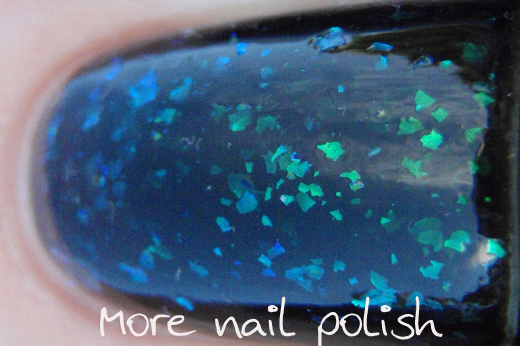 Eight of the nine polishes contain various glitter combinations, and the last one contains green flakies. I have one of the glitters and the green flaky to show you. 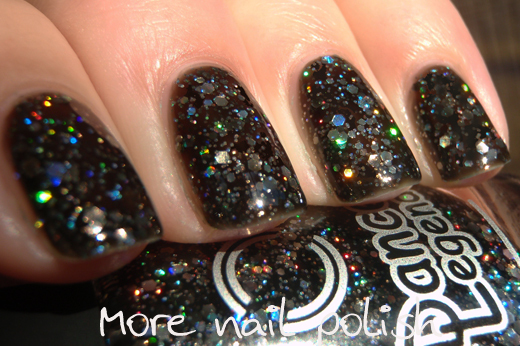 Christmas Eve - a black jelly base with silver holographic glitters in three sizes. Glitter payoff was fantastic, this polish is chock full of glitter, in fact there is so much glitter that the formula is a little thick. The jelly base is just the right opacity, sheer enough for the glitters to shine and show maximum depth and opaque enough to provide full coverage. This is two coats of Christmas Eve with Seche Vite top coat. 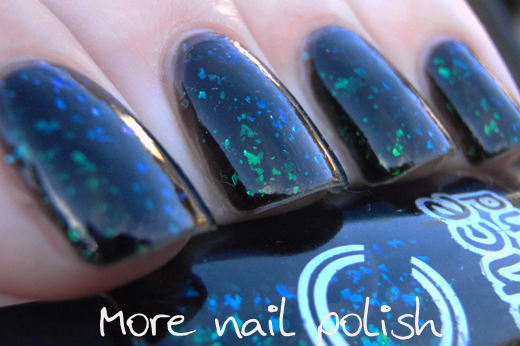 Green Mamba - a black jelly base with green to blue duochrome flakies. The formula on this one was smooth and easy to apply. 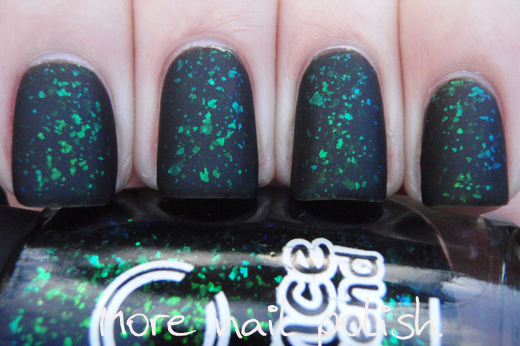 These first photos show two coats of Green Mamba with Seche Vite. I put this mani on at night time and photographed it in the morning - just like my usual routine. After I photographed it shiny, I knew that flakies look great matte, so I grabbed out my new bottle of OPI Matte top coat and slapped on a quick coat before work (at least so I thought I did). As I applied the top coat, I thought how milky it looked, but I knew it would go more transparent as it dried to the matte finish. I painted both hands with the top coat and waited a few minutes. For some reason the polish was staying shiny and it still looked really milky. It was only then that I realized that I had mistakenly grabbed my bottle of OPI Don't touch my tutu and applied a layer of it all over my perfect black nails - and just before work too! Let me tell you I was rather pissed off at myself. So I did want only another nail polish fanatic would be, I decided to be 10 minutes later to work and I removed all my polish and did it over again, with the correct matte top coat. And luckily, I loved the final look and it didn't matter that I was late for work. 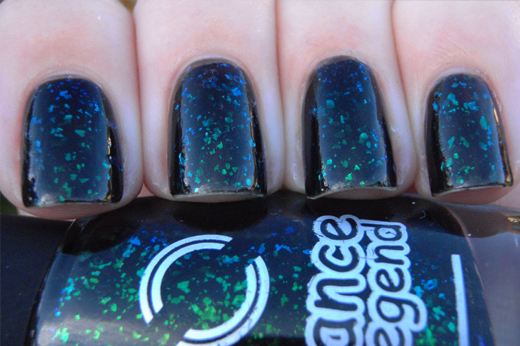 Dance Legend polishes are available from the Dance Legend website.The Rich Black polishes are $9 each and international postage is $10 (for free for more than 10 polishes). Green Mamba is my favourite of the whole collection. I wore it just the other day. I love Christmas Eve. That is what I hoped that Orly's Androgynie was going to turn out only it doesn't have near enough glitter. 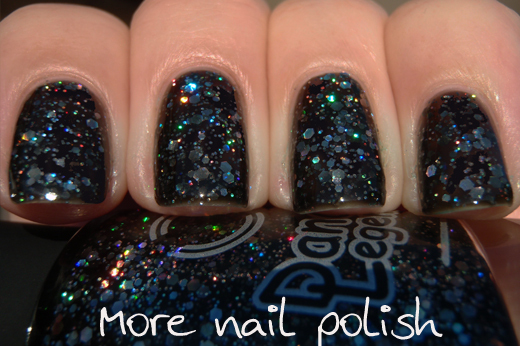 THIS is the polish I need. It looks amazing with matte! I just bought this Green Mamba and now I'm waiting for package from Russia :) I'm really excited! Green Mamba looks really awesome. So pretty! Both of them. Great looks and I think you did a fantastic job for just being 10 mins late. I got a few colors from them and now I wish I had ordered Christmas Eve too! Ha..ha..ha... your story sounds so familiar to me :) I have done the exactly same thing when I mess or chip my manicure :) Btw, isn't Christmas Eve a dupe for NYX Moonlight?